We've seen Doctor Who's time-wimey take on "A Christmas Carol", and now it's time to look ahead to season six. Let's examine the new trailer and learn what's in store for the Doctor and his friends. Spoilers and speculation ahead! Unlike last year's trailer, which included clips from as far ahead as episode nine, this trailer is mostly just the opening two-parter and assorted clips from the rest of the first half of season six. To the best of our knowledge, only the first four episodes have completed filming, while Matthew Graham's two-parter for episodes five and six is currently in the middle of shooting. As such, it's unlikely they would have any finished clips from those episodes available for this trailer. First of all, let's take a look at the trailer itself, in all its Doctor-in-a-cowboy-hat glory. Before we continue with the heavy-duty analysis, I'll say right now that I will be incorporating previously reported spoilers and set reports so that I can put what we see in the trailer into the fullest context possible. So if you don't want to be spoiled beyond what you can see in this trailer, you may not want to go further, although I'm mostly just speculating on major plot points, not actually giving them away. Anyway, with that in mind, let's get started! ...because this is even more unexpected. Nazis really will appear in this series for the first time in Doctor Who history, and judging by the insignia on the officer's uniform, we're dealing with the S.S. here. Once again, this is the first we've heard of Nazis appearing in this series, so it's hard to know what to make of this. We don't know where the Nazis are bursting into or what they're expecting to find, although it's a decent bet that it's the Doctor they're after. It might be worth considering the Doctor's opening lines of narration that plays right after these clips: "I've been running. Faster than I've ever run. Now it's time for me to stop." Could both the Cavaliers and Nazis be part of an extended cold open for the first story that illustrates how the Doctor always runs away after saving the day, as a bunch of his defeated adversaries burst in just after he's escaped in the TARDIS? It's possible, and certainly seems like the sort of thing Steven Moffat might do, but it's also possible the Nazis are somehow involved in Neil Gaiman's episode, as we still know almost nothing about what happens in that story. Based on Amy and River's clothes, this is from the opening story. Indeed, the companions' outfits are a helpful way to tell different stories apart. And this means that River does some TARDIS traveling in this story. There's a clearer shot of her later on, but the Doctor's running partner appears to be Suranne Jones, who plays the main guest character of Idris in Neil Gaiman's episode three. Gaiman revealed that Idris "...may very well be an old acquaintance of the Doctor with a new face...", and Doctor Who Magazine revealed she is preparing for death in this story, although she reportedly survives the episode. She's also said to have gone slightly mad and actually tries to bite the Doctor - implying that biting people isn't a normal activity for her, which suggests she isn't some sort of vampire, which are known to be among the Time Lords' oldest enemies. Of course, any talk of somebody showing up with a new face raises the possibility of a regenerated Time Lord (or Time Lady, in this case)...but I somehow doubt it. Our first shot of various men in black from the opening, America-set two-parter. This particular shot doesn't look like something from the White House, so it's more likely the presumably hidden military base - which may or may not be the infamous Area 51 - which we'll see more of in just a bit. This appears to be the leader of the White House Secret Service, played by Chukwudi Iwuji. Not too much to say about this, other than it's a very cool little shot - the first of many visuals from the opening two-parter that suggests director Toby Haynes has created something very special and epic here. And here's the Doctor in the Oval Office. The fact that the Doctor is sitting at the President's desk with the Commander-in-Chief nowhere in sight could be bad news for those hoping for a cameo by a Richard Nixon impersonator - which would make for a rather fun counterpoint to last year's Winston Churchill appearances, it must be said. And here it is. 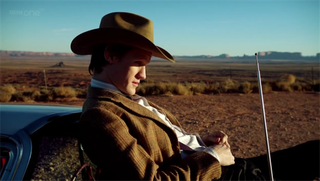 The first shots of Doctor Who's first ever proper filming in the United States, and we're treated to some beautiful Utah vistas. Again, this just looks so much more like a feature film than your average Doctor Who episode. Yeah...they probably couldn't have gotten a shot like this in a Cardiff gravel quarry. All in all, I'd say they got their money's worth from the American location shooting. This has got to be in the top five coolest shots in Doctor Who history. I promise I'll have some real analysis in just a moment, but right now I'm just enjoying the awesome. "I wear a Stetson now. Stetsons are cool." The Doctor has found a worthy successor to his fez, not to mention an official new catchphrase. It must be said, any coolness provided by the Stetson is rather quickly canceled out by the tweed jacket and bow tie. Sort of the matter and antimatter of eccentric sartorial choices. We're back in the military base - which, again, might well be Area 51, judging by the big painted "A-51" on the rear wall. Rather excitingly, here's our first glimpse of Mark Sheppard in Doctor Who, as we see his character Canton Everett Delaware III walking toward a prisoner that the signs are telling him not to approach. Less excitingly, all we see of him is the back of his head, so there's not much to go on yet. And in case anyone's wondering whether that's really Mark Sheppard, trust me...I can always recognize the back of Mark Sheppard's head. Call it a gift. One of the trailer's most intriguing reveals, the Doctor is the mysterious prisoner, and he's been there long enough to grow a pretty decent beard and go a little crazy-eyed. It's been heavily rumored that a future Doctor appears in this story, and it's kind of hard to believe that something so horrible will happen to "our" Doctor - the one whose adventures we're currently following, that is. River's line "We've been recruited" also raises the distinct possibility that the bearded Doctor has recruited River Song and his own former self to rescue him. Indeed, her other line that "You are going to have to trust us this time" suggests the Doctor cannot know that he's acting on orders from his future self, lest he create a time paradox. Whatever is going on, I'm guessing we're headed for some serious timey-wimey territory in this story. We find River Song in a TARDIS-esque console, one that is almost identical (but not quite) to the time ship seen in last series's "The Lodger." Here's a comparison shot from that episode - the colors on the consoles are different, as are the points of entry, but otherwise they're exactly the same. River is wearing her clothes from the opening story (and she's not thought to be appearing in episodes three or four anyway), which means the time machine will also appear in those episodes. The monster for this story is thought to be the Silent, which is almost certainly connected to the Silence that almost destroyed existence in "The Pandorica Opens." We don't really know anything about the Silence other than they have some pretty powerful control over time - they were able to make the TARDIS explode, after all - so perhaps this ship is Silence technology. Either way, it looks like the timeship from "The Lodger" wasn't just the throwaway plot device it initially appeared to be, which retroactively makes that episode even better than it already was. Thanks, series six trailer! Another, clear shot of the Doctor with Idris from the Neil Gaiman episode. Doctor Who Magazine revealed that this episode takes place on an alien junkyard planet, and the background certainly fits that description. It's worth pointing out here that this episode is said to be connected somehow to Patrick Troughton's epic 1969 swansong "The War Games", although we don't know which of the fifty or so plot threads in the original ten-part story Gaiman has decided to pick up on. We do know that the Doctor reflects on what SIDRAT stands for at one point in the story, and SIDRATs were the simple, TARDIS-like machine used by the villains in "The War Games" to kidnap soldiers from throughout Earth's history and make them fight each other. Between this and the last image, the first few episodes seem to involve a lot of rival time machines...unless they're all related somehow. Here's one of the possessed astronauts that menaces our heroes in the opening story. He probably was part of the crew of the "Apollo Ten-and-a-Half" that Steven Moffat mentioned a few months back. These scenes were all shot in Troy House back in the UK, although in the story the house is the American orphanage Greystark Hall. This sequence is likely part of episode 2 - a discarded call-sheet reveals lots of details for most of the scenes in Greystark Hall. "You have to do this. And you can't ask why." Based on Amy and Rory's costumes, this is still the first story, so this isn't directly related to whatever leads to the game-changing, series-dividing cliffhanger at the end of episode seven. Besides, they haven't shot that episode yet. Amy's refusal to explain to the Doctor what's going on is another indication that she's somehow working for the future Doctor, who is probably but not definitely the bearded Doctor chained up in the place that is in all probability Area 51 and is being menaced by a man who is almost certainly Mark Sheppard. That's just rock-solid reasoning right there. The TARDIS console just exploded, and Rory is wearing a different set of clothes - that means this is almost certainly the start of Neil Gaiman's episode, in which the TARDIS breaks down and ends up on that junkyard planet. Amy is nowhere to be seen in this shot, although I doubt she's gone for very long. Admittedly, my whole "identify episodes based on companions' costumes" method kind of falls apart when companions change their costumes mid-story. I think this is still from the opening story and we're still in Greystark Hall. Her clothing seems a bit more formal than her usual attire, so it's possible Amy has been doing a little undercover infiltration of the orphanage posing as some sort of official. You can just make out Rory's vest in the background of this shot, which means this is episode three again. There's not much I can say about this clip, although presumably the Doctor is holding some mysterious or long-neglected gadget that will somehow help after the TARDIS breaks down. I must admit I had not expected to see an apparently naked River Song in the trailer. This might actually be the same Millennium Stadium location used last series for the Storm Cage, River's prison cell in "The Pandorica Opens" - it's believed the crew filmed scenes there for this episode back in October. Of course, that might provide a rather obvious explanation for her disrobed state, as a newly incarcerated prisoner might have to strip when beginning their sentence. If that's the case, I would suspect this is right at the end of the opening two-parter, as River arrives at the Storm Cage and we see how her timeline will now lead her back to where we saw her in "The Pandorica Opens." That would rather suggest her much-discussed murder of the finest man she ever met will indeed happen in this first story, which probably means it wasn't the Doctor she was talking about after all. Unless she killed the future Doctor...you know, I think I'm starting to let my guesswork run away from me, particularly considering my only clue is a naked River. Another beautiful Utah vista. I suspect lots of not strictly necessary long-range establishing shots will be this story's version of the Doctor and Romana aimlessly touring the streets of Paris in the classic serial "City of Death" - all a bit gratuitous, to be sure, but once you've got your expensive foreign location, you really ought to show it off as much as possible. Here we find Rory and (presumably) Amy running through some corridors, keeping alive one of Doctor Who's oldest traditions. There's some thought that these are actually corridors in the TARDIS itself, which supposedly go in every conceivable direction (including straight up and straight down) and require passwords to move through them. Based on Rory's clothes, we're looking at a scene from Neil Gaiman's episode. Since that episode is set in a massive junkyard, there might not be a lot of pristine corridors outside the TARDIS for Rory and Amy to run around in, so perhaps this really does all happen inside the TARDIS — but that part is still just a rumor. And now Rory gets trapped on the wrong side of some closing doors. Assuming this shot is from the same sequence as the previous one, it would seem Amy was able to make it to the other side just in time, leaving Rory stranded all by himself. ...an Ood! I will admit, I did not see that coming, particularly because I didn't expect to see any returning monsters. You might remember executive producer Piers Wenger had said this season wouldn't feature a lot of old monsters, so an appearance of an Ood might seem to go against that. Of course, what he actually said was "We're much more interested in new monsters than we are in classic ones", which suggests he was just talking about not bringing back monsters from the classic series. By that definition, the Ood count as a new monster. The real question is where in its species's history does this particular Ood come from - during their period of enslavement by humanity seen in "The Impossible Planet"/"The Satan Pit" and "Planet of Ood", during their time as a powerful time-sensitive race seen in "The End of Time", or something else entirely? It's also possible that this isn't actually an Ood at all, and it's really some sort of manifestation. That becomes more likely if these corridors really are inside the TARDIS. Whatever the case, this particular Ood doesn't look very friendly. Of course, compared to these monstrosities, that Ood was downright adorable. These are the villainous china dolls that appear in Mark Gatiss's fourth episode, widely believed to be called "What Are Little Boys Made Of?" This is the only story of the three depicted in the trailer that is set in the present day, and it is thought to be all about a little boy named George who lives with his parents in some rundown council estates. Set photos reveal that characters in the episode reappear as these living china dolls, although we don't know yet whether they're actually transformed into the dolls or these are simply fashioned in the image of human originals. Either way, they look utterly terrifying. And just in case you were worried these dolls weren't big enough to threaten humans...yeah, not so much. Indeed, the Doctor and his companions are reportedly threatened by a lot of giant-sized objects in this episode, including evil toys and a huge pair of scissors. That's Rory's episode four costume, by the way, although we don't see much more of it in this trailer. We're back to the opening story for some more of episode 2 in Greystark Hall. We know it's the opening story because of all the marks on Amy, which had previously been spotted on both Karen Gillan and Alex Kingston during the shooting of this story. She's wearing the same black costume as the one in the earlier scene, so that confirms she does indeed change outfits between episodes 1 and 2. Oh, and then there's what she's actually screaming about, considering this is the only proper scream in the whole trailer. It's possible she's being menaced by the possessed astronaut we saw earlier, but there's another possibility: this is her first confrontation with one of the Silents. "You see these eyes? They're old eyes. And one thing I can tell you. Monsters are real." Not much we can say about this still - I'm not even sure which episode it might be from - but that is a pretty great line, and a good reminder of how old the Doctor really is despite his eleventh incarnation's youthful persona. More of the tally-marked Amy from the opening story. The Greystark Hall sequence does not appear to be for the faint of heart, I'll say that much. And now we see more markings on River Song. The dress she's wearing and the set behind her appear to match what was seen during filming of a scene between her and Mark Sheppard's Canton Everett Delaware III. Based on overheard dialogue, River told Canton in that scene that Earth had already been invaded. I'm not sure how this little bit fits with the rest of that scene, although I suspect this shot comes from just before her confrontation with Canton, perhaps when she makes a startling discovery that confirms Earth really is under attack, but that's definitely just a bit of guesswork on my part. That's Rory's opening story outfit, so there are a couple possibilities here. It's possible that Rory is in Greystark Hall, but the background is dark and indistinct enough that we can't know for sure. Another possibility is that Rory is in the timeship we saw River enter earlier, perhaps coming in right behind River. And then we have this, a shot so intriguing that even a bearded Doctor and a naked River pale in comparison. This looks an awful lot like the so-called "Greys", the extraterrestrials who pop up in a lot of real world tales of alien encounters. In the story, this might well be our first glimpse of a Silent - the Utah set reports suggest the Silent was played by a very tall, thin actor wearing a prosthetic, and that description seems to be a good fit for what we see here. Considering the suit and tie he appears to be wearing, it's quite possible that he was previously disguised as one of the agents. Whatever the case, this guy should keep us guessing until April. In putting together this post, I relied extensively on the amazing work done by the fine folks at Doctor Who Spoilers and the Gallifrey Base forum. Check both out often for all the latest spoilers and speculation.